The Soyuz-2.1b rocket lifted off from pad 31 at Baikonur at 1647 GMT (11:47 a.m. EST; 9:47 p.m. local time) with EgyptSat-A, a remote sensing satellite built by Russia’s RSC Energia aerospace manufacturer to provide the Egyptian military and other government agencies with high-resolution surveillance imagery. Energia and Roscosmos, the Russian space agency, confirmed the Soyuz-1.b rocket and its Fregat upper stage delivered the EgyptSat-A spacecraft into the planned orbit. U.S. military tracking data indicated mission deployed the satellite into an orbit more than 400 miles above Earth, at an inclination of 98 degrees to the equator. But Russian news reports suggested the mission may have experienced a close call during the climb into orbit. Russia’s Tass news agency reported the EgyptSat-A satellite and its Fregat upper stage were tracked in a lower-than-expected orbit after the three-stage Soyuz booster deployed the rocket’s upper unit around nine minutes after liftoff. But Tass reported that burns by the Fregat upper stage appeared to have corrected the apparent performance shortfall, which may have occurred during the third stage’s engine firing. The Fregat upper stage was expected to ignite twice to deliver EgyptSat-A to its intended orbit. The RIA Novosti news agency also reported the launcher was observed in a lower-than-planned during Thursday’s flight, attributing the information to two space industry sources. In the end, Russian officials said EgyptSat-A was released at the expected altitude, and the solar panels on the satellite unfurled as designed. The Soyuz-2.1b variant of Russia’s venerable Soyuz rocket family uses a different upper stage engine than the version used for crew launches. The Soyuz-2.1b uses a four-nozzle RD-0124 engine, while the Soyuz-FG and Soyuz-2.1a configurations employ a RD-0110 third stage engine. The next Soyuz crew launch, with two NASA astronauts and a Russian cosmonaut heading for the International Space Station, is scheduled for March 14. The next launch of a Soyuz rocket carrying satellites was scheduled for Feb. 26 from French Guiana, a commercial mission under the management of the French launch provider Arianespace. That flight is slated to use a Soyuz ST-B rocket, a variant that uses the same third stage design as the Soyuz-2.1b launcher that flew Thursday with EgyptSat-A. The upcoming launch from French Guiana was pushed back at least 24 hours until Feb. 27 to allow engineers more time to review data from the EgyptSat-A launch, according to Greg Wyler, founder and chairman of OneWeb, which plans to launch its first six broadband satellites on the Soyuz. 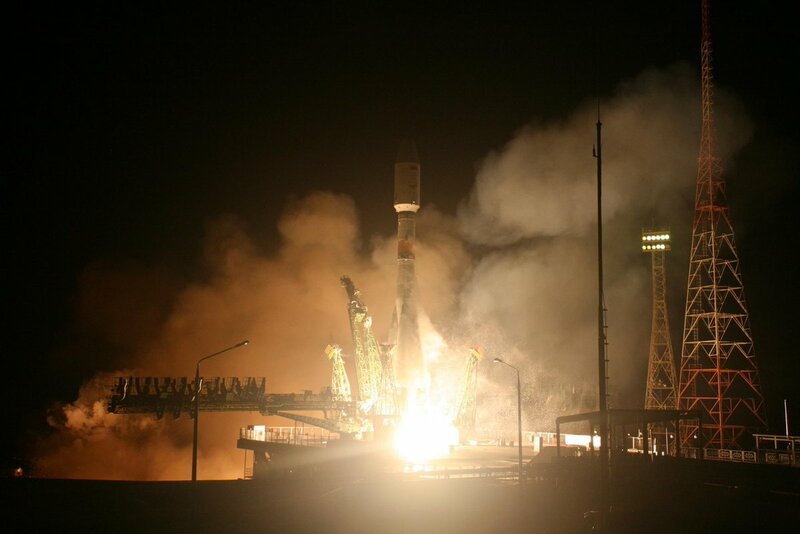 Thursday’s Soyuz flight with EgyptSat-A was Russia’s first space launch of the year. EgyptSat-A replaces the EgyptSat 2 Earth-imaging satellite, which failed in orbit in 2015, one year into a planned 11-year mission. EgyptSat-A satellite was manufactured with money from an insurance payout from the loss of EgyptSat 2, according to Tass.